Boron is a chemical element. It has the chemical symbol B. It has the atomic number 5. It is a metalloid (it has properties of a metal and a non-metal). Much boron is found in chemical compounds in its ore borax. Boron is never found free in nature. Two types of boron are found (allotropes). Amorphous boron is a brown powder and metallic (crystalline) boron is black and hard and a weak conductor at room temperature. Pure boron is used as a dopant (a substance added to semiconductors to change how it behaves with electricity) in the semiconductor industry. Chemical compounds of boron are important as to make strong materials not weigh very much, as nontoxic insecticides and preservatives, and for chemical synthesis. Plants need boron in them to live. Very small amounts of boron are needed in animal's bodies so that they are very healthy. How it keeps animals healthy is not known in a lot of detail. Boron was discovered by Sir Humphry Davy, an English chemist, in 1808. Boron melts at 2075 °C (3767 °F), and boils at 4000 °C (7232 °F). ↑ 2.0 2.1 Zhang, K.Q. ; Guo, B.; Braun, V.; Dulick, M.; Bernath, P.F. (1995). "Infrared Emission Spectroscopy of BF and AIF". J. Molecular Spectroscopy 170: 82. doi:10.1006/jmsp.1995.1058. http://bernath.uwaterloo.ca/media/125.pdf. ↑ Melanie Schroeder. "Eigenschaften von borreichen Boriden und Scandium-Aluminium-Oxid-Carbiden" (PDF) (in German). p. 139. ↑ Gay Lussac, J.L. ; Thenard, L.J. (1808). "Sur la décomposition et la recomposition de l'acide boracique". Annales de chimie 68: 169–174. https://books.google.com/books?id=e6Aw616K5ysC&pg=PA169. ↑ Davy H (1809). "An account of some new analytical researches on the nature of certain bodies, particularly the alkalies, phosphorus, sulphur, carbonaceous matter, and the acids hitherto undecomposed: with some general observations on chemical theory". Philosophical Transactions of the Royal Society of London 99: 39–104. doi:10.1098/rstl.1809.0005. https://books.google.com/books?id=gpwEAAAAYAAJ&pg=PA140. ↑ 9.0 9.1 "Atomic Weights and Isotopic Compositions for All Elements". National Institute of Standards and Technology. Retrieved 2008-09-21. 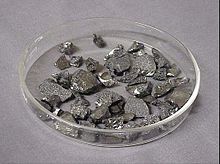 Wikimedia Commons has media related to Boron. This page was last changed on 15 January 2019, at 08:07.